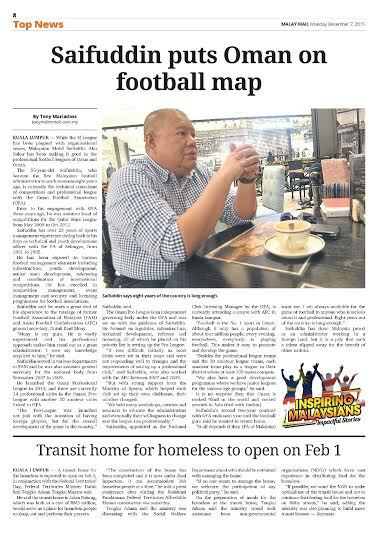 While M-League has been plagued with organisational issues, a Malaysian, Mohd Saifuddin Abu Bakar has been a key player in the professional football leagues of Qatar and Oman and making it good. Malaysian football after more than two decades of professional football (Semi-Pro launched in 1989 and went fully professional in 1994), after grasping with issues after issues will see the league privatised next year. The 55-year-old Saifuddin, who became the first Malaysian football administrator to work overseas eight years ago, is currently the technical consultant of competitions and pro league with the Oman FA. Prior to his engagement with Oman FA four years ago, he was the assistant head of competitions of the Qatar Stars League from May 2009 till Oct 2012. Saifuddin has over 23 years of hands-on sports management experience - having been exposed in various football management elements including infrastructure, youth development, senior team development, competitions, refereeing and international competitions coordination. His strengths lie in competition management, event management, security and licensing program for Football Associations. Saifuddin said that he owes a great deal of his experience to the tutelage of former FA of Malaysia and Asian Football Confederation general secretary, Datuk Paul Mony. “Datuk Paul is my guru. He is vastly experienced and his professional approach makes him stand out as a great administrator. I owe my knowledge acquired to him,” said Saifuddin payin tribute to Mony. There are 14 professional clubs in the league and besides another 30 amateur clubs with Oman FA. “The Pro-League was launched not just about having foreign players, but for the overall development of the game in the country,” said Saifulddin when met in Muscat recently. The Oman Pro-League is separate working body working under the Oman FA and Saifulddin was responsible for putting it in place. He had looked into aspects like legal, infrastructures, technical development, referees, licensing the clubs which was under his priority list of setting up the Pro-League. “It was difficult initially as most clubs were set in their ways and were not responding well to changes and requirements of setting up for a professional club,” said Saifulddin who has also worked with the Asian Football Confederation (AFC) from 2003 to June 2007 in various capacities ranging from coordinating FIFA matches and competitions, event manager and as regional officer. “But with strong support from the Oman Ministry of Sports which helped each club set up their own club house, the mind-set changed quickly. “Football is the number 1 sport in the country. Although it has only, about 4 million population, every evening, everywhere, everybody is playing football. This makes it easy to promote and develop the game,” said Saifulddin whose second two-year contract with OFA ends next year. “Besides the professional league teams and the 30 amateur league, each of the amateur league teams organise their own league in their district where at least 100 teams compete in each district. It is no surprise that Oman is ranked 92 in the world and ranked seventh in Asia (tied with Jordan). Asked if he is going to stay on in Oman with a fresh contract, Saifulddin said that eight years out of the country was long enough and he wants to return home. On his reasons for leaving for overseas in the first place, he said it was because he just wanted to work as a professional but was not able to do so in Malaysia. "I am a straightforward person who only wants to work professionally and with the interest of sports at heart. "Sometimes it was not possible in Malaysia, which saw me frustrated. "Thus when I got an opportunity to work overseas, I went for it. "And it was a wise decision because my services were valued and appreciated. Above all I was able to impart my knowledge for the betterment of the game." Indeed, Saifulddin has done Malaysia proud as an administrator working in a foreign land, but it is pity that such good talent in the game slipped away for the benefit of other nations.